This past weekend, Andrew had the pleasure of accompanying me on my drive home from Los Angeles. Here's a step-by-step guide of how to best structure your drive from Los Angeles to the Bay Area. Step 1: Intend to go to brunch before your journey at 8. Step 2: Go to brunch at 9 at a restaurant that isn't even off of any freeway that you will be using on your drive up. 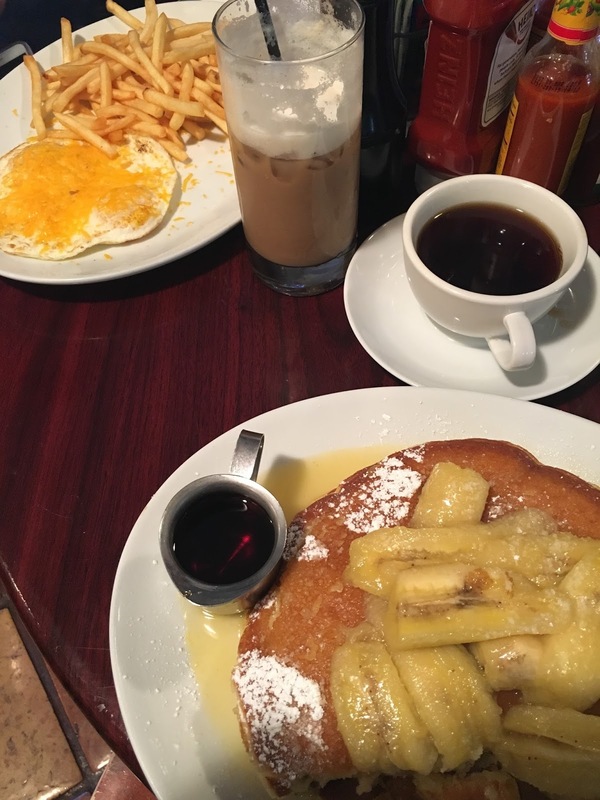 Step 3: Eat bananas flambe pancakes at brunch. Step 4: After brunch, buy snacks at Whole Foods, specifically sweet potato chips and Annie's fruit snacks, in an attempt to kill time until 10 when the CD store next to the brunch restaurant opens. Step 5: Go to the CD store when it opens and pick out at least 5 CDs to listen to in the car on your drive up. Step 6: Say goodbye to your best friend who is the only reason you went to brunch at that place and cry a little bit. Step 7: Start driving on the 405 to the 5. Step 8: Exit at Tejon Ranch (Laval Rd West) to fill up your tank to last for the rest of the journey. Step 9: Suddenly stop at the Tejon Outlets on the other side of the freeway. Step 10: Buy a pair of shoes at the Nike outlet because they are on sale. Step 11: Get back on the road. Step 12: Stop at Kettleman City ( Hwy 41) to pee and get some more coffee for the drive. Step 13: Pump yourself up while driving by listening to musical soundtracks, none of which are the 5 CDs you bought earlier. Step 14: Don't yell at Andrew until the last hour of your trip. Step 15: Make it home.